Scrubs, wraps and gentle body peels using Pure Fiji is going to leave your body feeling incredibly smooth, hydrated and cleansed like never before. The fragrances and exotic oils of Pure Fiji will have you believing you have been transcended off into the tropics and leave you with nothing less the feeling of total indulgence. With hot stone back massage & Express facial. This ultimate body treatment begins with a masque rich in AHA which will gently but effectively produce a total skin renewal. While the masque is allowed to work its magic lie back and relax with a face massage before a total body exfoliation to nourish, hydrate and smooth your skin. Hydrating your skin and detoxifying your system will leave your mind renewed and body restored. Your skin is gently dry brushed and then warmed oil containing vitamins and antioxidants is applied. Your body is relaxed and wrapped while a mini facial relieves all your tension. This treatment leaves your body hydrated and restored. Exotic tropical nut oils and fruit enzymes nourish skin with vitamins A,B, C & E to create the ultimate healthy glow. Relax and enjoy as an application of pure cane sugar infused with tropical nut oils are rubbed onto your skin – using coconut milk to break down the sugar allowing the natural alpha hydroxyls to occur. This will rid the body of dead skin, reveal new healthy skin and strengthen the skin’s elasticity, not to forget replenish moisture loss. Sit back and relax while your feet soak in warmed coconut milk to soften and hydrate, a pure Fiji sugar scrub will have you feeling ever so smooth and cleansed. Lastly a dip in a peach paraffin foot bath or a frangipani mask will have your feet feeling unbelievably refreshed. Cleanse, polish and protect your skin. Pineapple extracts gently buff away dull skin cells and unclog pores rejuvenating your skin followed by an application of Hydrating Body Lotion which rapidly hydrates your skin with fresh coconut milk and a nourishing blend of exotic nut oils which will stay with you all day. 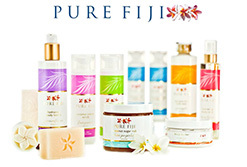 We carry a range of Pure Fiji products to purchase so you can take a slice of heaven home with you. These products make perfect gifts.